A military recruiter can help answer questions about service, which can provide a positive but realistic assessment of opportunities. Recruiters from multiple Service branches may share a location, and you should feel encouraged to speak to more than one. Parents should also feel comfortable talking to recruiters. It is a recruiter's job to address concerns and provide quality information to those interested in serving and those close to them. Service members and a recent applicant describe what happens during conversations with Army recruiters at recruiting command. Staff Sgt. Adam Folger: My name is Staff Sergeant Adam Folger, and I am the station commander of the Waltham recruiting station. When an applicant first comes in for an initial appointment, the first thing I ask them, after we, you know, we talk for a little bit and I try to get to know the applicant, is I ask them what their short- and long-term goals are, where they see themselves five, 10 years now. "If you could have the ideal job in life, what would it be?" Then I try to explain to them exactly what the Army does — Active Duty and Reserves. And I see if either one is a good fit for them. Chris Jannis: My name is Chris Jannis. I've been talking to the Army about joining as a bridge crewmember. It's been something I've been interested in for the past five years or so. Sgt. 1st Class William Maldonado: Hi. My name is Sergeant First Class William Maldonado. I am a U.S. Army recruiter, also a Reserve recruiter here in Waltham. Staff Sgt. Adam Folger: When we make the appointment — I have all my recruiters do this — is I have them tell the applicant over the phone, before they come in, to write down any questions that are important to them. So that way, they don't forget them when they do come in. It's a lot different talking over the phone. They might not be as nervous. They haven't met us yet. They come in, and they forget all the questions that they wanted to ask. Sgt. 1st Class William Maldonado: They want to know about travel, where they can go, where they might be sent. Education benefits. A lot of people come in here with student loans that need to be repaid, and the Army could be an option for that. So there's a number of questions people ask us. Chris Jannis: I had an idea of where I wanted to go, what I wanted to do with the Army, so it was just a matter of understanding exactly what all of my options were and making sure that I was making the best decision for myself. Sgt. 1st Class William Maldonado: Come in here prepared. Write down a list of questions of what that job might entail. And we also ask them to write down pros and cons of coming into the Army. And then we help them through making the choice. Staff Sgt. Adam Folger: I encourage them to go home and talk to family members, significant others. In most cases, I will suggest that, for the follow-up appointment, they have their significant other whose, you know, opinion means the most to them, to come in with them. Or, I go sit with them at their house or wherever they'd like to meet. So that way, they have that extra support, added support, knowing that the decision that they're making to enlist will be the right one. Chris Jannis: We're moving at a pace that I'm comfortable with, and I think that the recruiters are able to kind of read and judge what each person needs, and understand, you know, how to work with each individual person so that we're comfortable with the process and we're only doing things when we're ready to do them. Staff Sgt. Adam Folger: From the time an applicant enlists — the day they sign their contract — until the day they ship to Basic Training, they're in what's called the Future Soldier Program. During that time, we're going to work with them and get them ready for Basic Training, whether it be for doing physical training — pushups, run, situps, exercise, things of that nature — and then we have some classes that we can help them work on that will help get them promoted. They can earn a promotion while they're in the Future Soldier Program. Chris Jannis: The whole thing has been a much more pleasant experience than I expected it to be. And I think that's really the most important thing that the recruiters really show, that they want to work with you rather than saying, "This is what we've got; this is what you're going to take," which is what I think what a lot of people expect when they first walk in. So overall, it's been a much easier experience, and they've made the whole thing, you know, from paperwork to taking the test, a pleasant experience overall. Army National Guardsmen talk about what it was like going through the enlisted recruitment process. The process involves meeting with a recruiter, taking the Armed Services Vocational Aptitude Battery (ASVAB), going to a Military Entrance Processing Station (MEPS), choosing a Military Occupational Specialty (MOS), and completing Basic Training as well as Advanced Individual Training (AIT). Female Speaker 1: The recruiting process is, the applicant will come into the office and meet with their recruiter, talk typically about what it is you want to do, what are your intentions in joining the Guard, and then, after that, you would set an interview to ASVAB. Male Speaker 1: An ASVAB is a Military Aptitude Battery Test. Pretty much, it's how well you perform on certain tasks. Female Speaker 1: And once you ASVAB, you would do a physical. Male Speaker 1: And then you'd go to a Military Entrance Processing Station, which is called MEPS. Female Speaker 1: You will pick a job that you would be most interested in. And then, after that, you will swear in and go off to Basic. Female Speaker 2: Really, it's just working with your recruiter. They do all the hard stuff, and you just get sent out and you go to Basic Training. From there, you go to your specialty training, which is what your MOS is -- AIT, Advanced Individual Training. Male Speaker 2: The recruitment process is pretty fast. After I get my score, I got to choose my MOS. After choosing my MOS, I go there to sign the contract and swear in. Female Speaker 2: I went to split option. It's where you're a junior in high school. So, you go through Basic, between your junior and your senior year, and then you go to AIT, once you graduate. Female Speaker 3: From the moment I first spoke to a recruiter, it took me a good nine months to decide that I really was ready to do it. I talked a lot with my family and made sure they were behind me, obviously, because it's a big part of their lives, too. And then, as soon as I was ready, I went and swore in. What is the recruiting process like from beginning to end? What's the Delayed Entry Program? What really goes on in Basic Training? What kind of condition do you have to be in at the start? What are the physical standards candidates have to meet? What percent of people who start Basic Training complete it? Can two friends go through Basic Training at the same time? How long does the first term last? Do you have programs of different lengths? Can an entrant choose the military job he or she wants? How is the job assignment made? Can you describe a couple of jobs? Can a trainee choose to serve overseas? How much does a new recruit get paid, and what are the benefits? How often are service members promoted? What kind of training comes after Basic Training? How good are your military job-training schools? 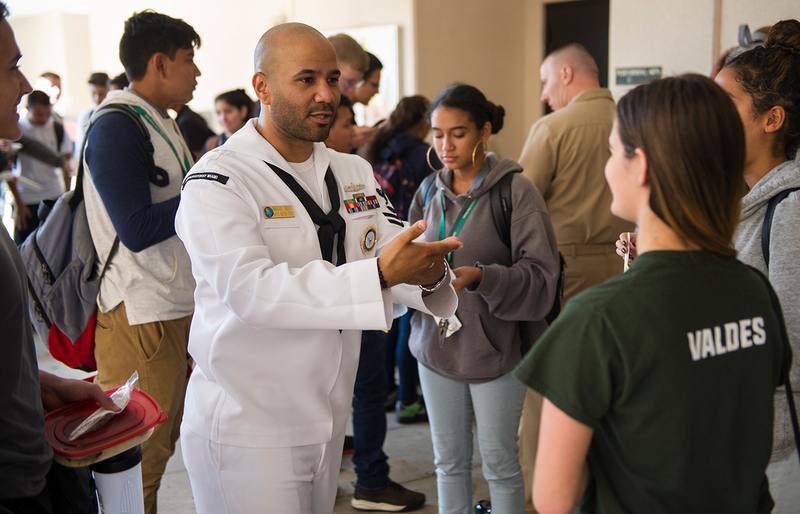 What are all the ways a service member can earn college credits during enlistment? What are your tuition-support programs? How does an entrant qualify for them? How long will my child’s first term last? Do you have programs of different lengths? How much will my child get paid, and what are the benefits? Can my child marry and have a family while serving? How often will I see my child? Where will he or she primarily be working? Where will my child be based? How many days off will my child have each year? Will my child still be able to begin or complete his or her college degree? What if my child changes his or her mind? Recruiters can be a great source of information for young adults and their parents. Hear about parents' experiences and learn what to ask. Nancy Kennon: Julia went down several times. I took her down to the recruiters' office, and they went through ... they really went thoroughly through everything with her. I was really shocked how she knew so much about everything they offered and all the jobs there were. It was kind of hard for me to get her to go and get motivated, so I would call the recruiters, (laughter) and I got them set up where they would come and jog with her and work out with her, and they were doing that three to four times a week. And they had her ready within — she couldn't do one push-up — and within two weeks she was doing 21 push-ups and running her mile and a half. Darlene Anderson: He had an awesome experience with his recruiter. Actually, they really had a really close relationship. Betty Simmons: His recruiter called us when they picked Matt up to take him for his physical and stuff. He stopped at the house and, you know, said, you know, they'll take care of him and where he's going and what will happen. Mary McHugh: He was very down to earth, very soft-spoken, you know, very real, and he explained, you know, what Basic Training was going to be like, that it was going to be very difficult, but he also explained that the potential that these young men and women are going to experience as a result of belonging to the Military is immense. He could be anything he wanted. And then he said, "Ms. McHugh, he could be a doctor if he wanted to be a doctor." Patricia Smith: Would not give up. David Smith: — because he wanted him to get in. Jayne White: Well, I'm lucky that his recruiter was in the town where I worked, so he took me down to the recruiter, and I got to meet the nice gentleman that took my son under his wing, I want to say, because they would go, they'd go running. He had to lose some weight, so they would have to do runs and exercises before he went off to boot camp, and that was especially good for me to know the recruiter.